An editorial for those who support Algonquin Elder William Commanda’s vision, for those who are hearing about it for the first time, and especially for those who are making choices that affect us all. Remember…Ginawaydaganuk! 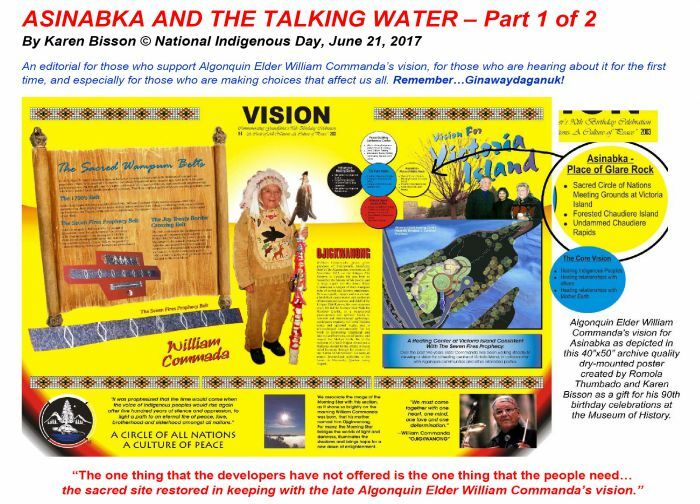 Asinabka, at the site of the Chaudière Falls in downtown Ottawa, is an ancient Indigenous sacred site that is at least 8000 years old, according to the late Algonquin Elder Dr. William Commanda, OC. Despite decades of lobbying by the elder to see the site restored, Chaudière Island, the land at the very core of the site and the only island that actually faces the falls, is slated for privatization and commercial development by Windmill Development Group with their controversial Zibi project. The purpose of this document is to provide historical context and evidence that the site is indeed sacred, and to ask the public to act immediately by contacting the Federal Government as well as the City of Ottawa, and by joining the campaign to support the restoration of this site in keeping with William Commanda’s vision. Part 1 of this article provides historical context and a brief biography of Elder William Commanda. Part 2 contains information regarding the current challenges for control of the site.